Fortunately for today’s students, many schools have taken the impressive step of integrating technology into the classroom in a comprehensive way. Once unheard of, the concept of a 1:1 device environment is quickly growing to be common. One benefit for educators is knowing all students are able to access material in the same manner, regardless of personal circumstance. It also allows cohesion with files and documents being compatible, rather than trying to find a common software system that works equally well on a hodgepodge of devices and computers. But what does this mean for the projector game? Does this make a central display obsolete, as each child focuses solely on the smaller screen below their noses? Hardly. For effective and engaging learning, collaboration is key. While the ability to complete individual coursework and use digital materials on each student’s personal timeline is a big perk (no waiting for the whole class to reach the bottom of a page during read-along sessions) — these same devices can be morphed into projection projects through mirroring. This can be student led, a higher tech version of raising a hand and responding, or teacher-led as the educators keeps kids on their toes by randomly choosing a device to dial in and share work. Group projects can also be enhanced as individual student sections of a presentation can be edited together before using the main projector to share the project with the class. A recent study found frequent group activity in classrooms can lead to twenty percent higher development of social-emotional skills. Frequent contribution in the classroom through group activities also adds to a student’s sense of confidence. Using 1:1 devices and one central classroom screen marries the two aspects of learning for the best of both worlds. While not all projectors are created to support wireless mirroring of multiple devices, many can be morphed into this handy mode of tech with the help of devices and apps once meant for home entertainment. While they might have been designed to help a larger audience enjoy slideshows, movies or video clips from your phone — or commercial-free movies from subscription services on non-smart TVs — these inexpensive devices can plug into most school projectors via HDMI or other inputs. 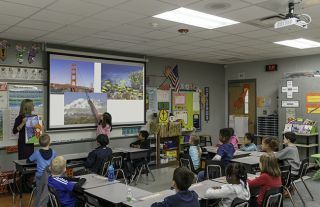 Roku devices, Apple TV, Chromecast, Miracast and All Share Cast are a few options that can turn a basic projector into tech primed for classroom presentations. One important thing to remember when choosing for your classroom is compatibility. Apple TV can mirror media from MacBooks, iPhones and iPads. Miracast works with Samsung and Android tech, but not Apple products. Chromecast offers a little more flexibility; allowing PCs, Macs, Androids and iOS to connect, but does so through the use of apps rather than direct mirroring. Roku can stream from many newer devices and offers access to educational viewing apps like PBS, History Channel, Discovery and more. One big plus for educators battling strict school WiFi restrictions that protect students from the distractions of social media, direct connecting through a teacher’s cell service can allow access to educational and appropriate material that might be inadvertently blocked. Another plus of displays with wireless mirroring is the ability to engage and include students who might otherwise have challenges in participating. A student who is physically unable to use her voice (making Google Slides a challenge) can beam the screen of her communication device to share her history presentation with the class. A student unable to hold a pencil can complete a team worksheet with his peers as they digitally annotate a scanned version together. A student with impaired mobility can connect his laptop to the projector to participate in a group activity without needing to physically stand at the board with his classmates. Device sharing can help create a truly inclusive classroom.